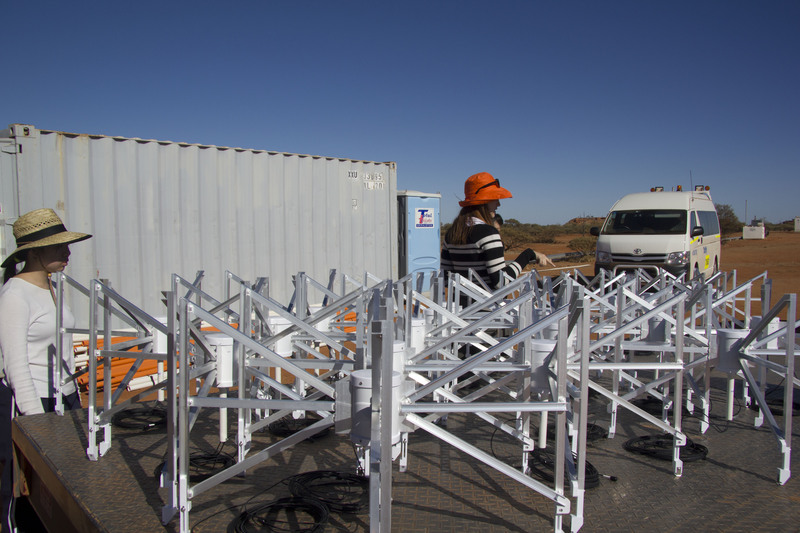 Today we installed all 60 of the beam formers that have arrived on site – this means we’ve done as much of the alpha and beta MWA sections as we can, which was the main goal of the trip. As some of the students would say ‘Achievement Unlocked’. 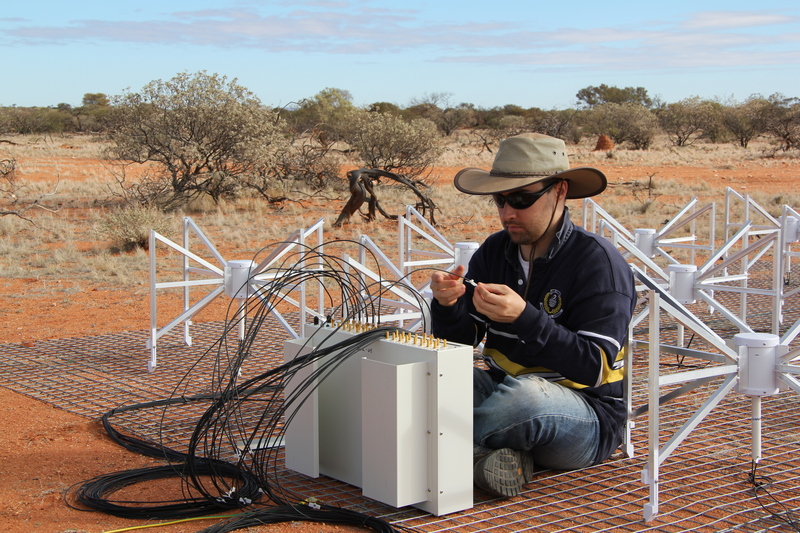 Luke attaching cables from each dipole to the correct place on the beam former. We managed to install and hook up all the beamformers before lunch! We’re all working well together as a team. 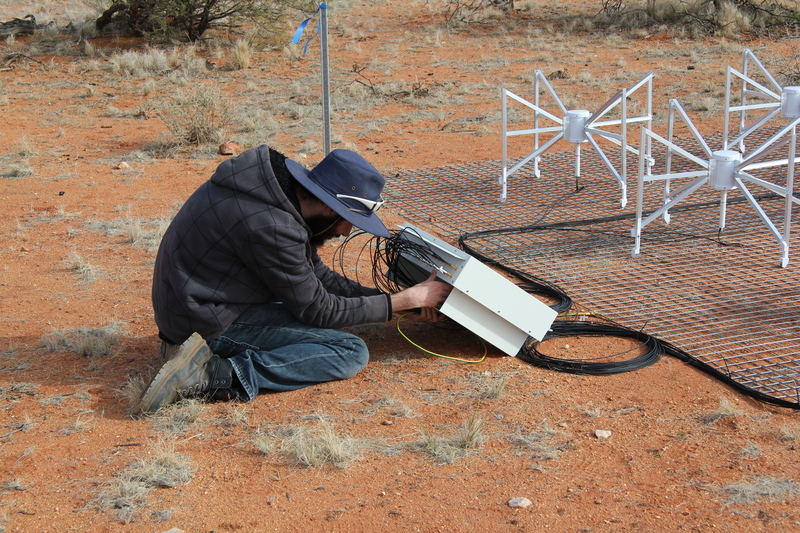 Sammy hooking up a beam former in the core of the MWA. Our next goal is to get as many tiles as possible cabled up and finished. We’re on 88 tiles after today’s effort, leaving 40 to do tomorrow for a complete finish (our last day). Phew, hopefully we can do it. A few of us also took a minute to head up one of the breakaways to look over our site and see the progress we’ve made in the last 11 days. Breakaways, a beautiful feature of the country up here. 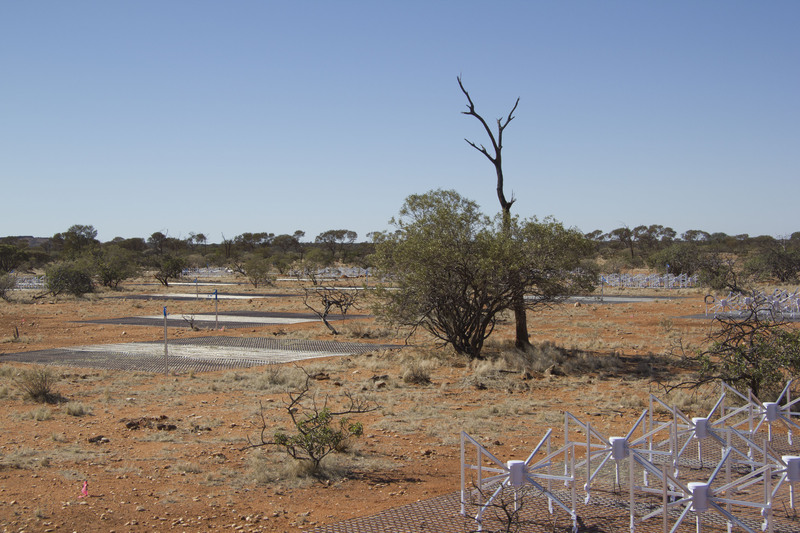 Lovely view of ASKAP, it’s great to see all 36 dishes constructed – congrats CSIRO! 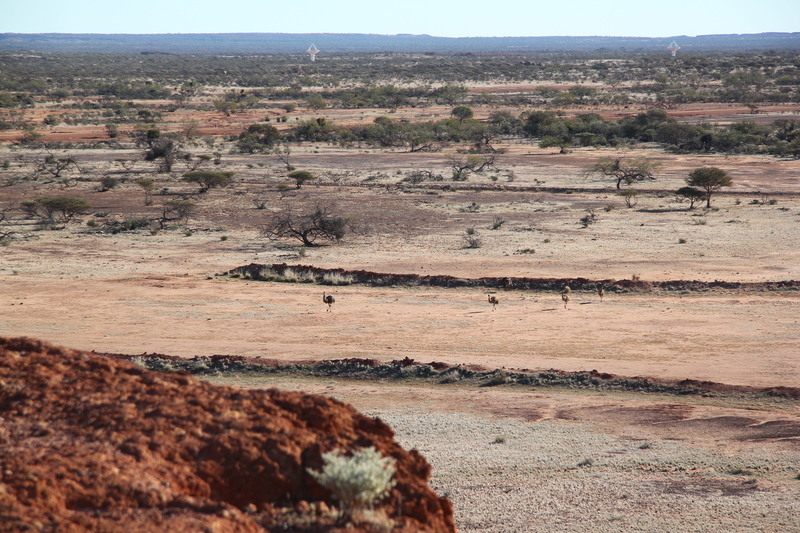 The MWA core from the breakaway – looking good! 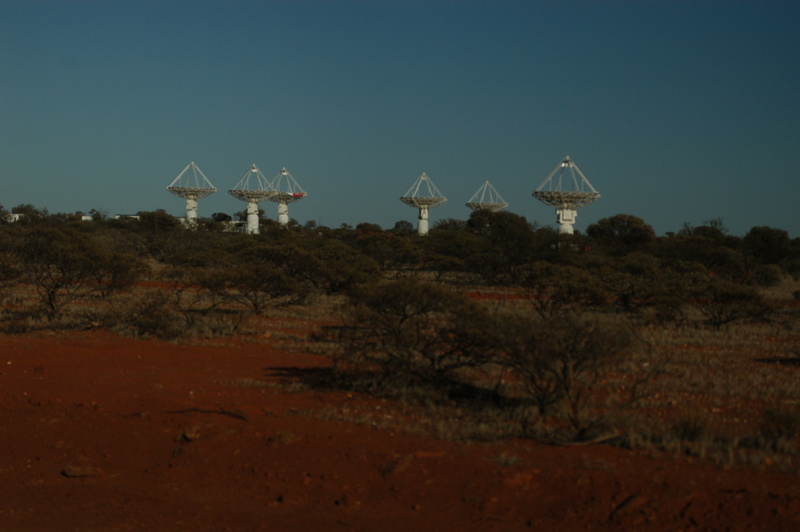 Kim with the MWA core in the distant background. Sammy with an ASKAP dish in the background. Emus hanging around the breakaway. Tomorrow we are going to have a visitor from Perth, and hopefully finish everything off! Looking forward to it. Lots of excellent excellent news today. 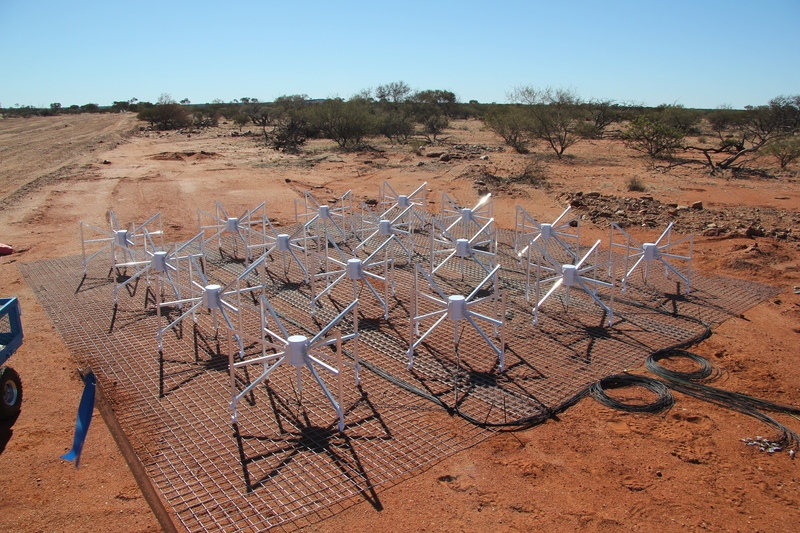 Firstly: we finished all the dipoles! YES! Secondly, the beam formers have landed. So now we can start forming beams, or something. 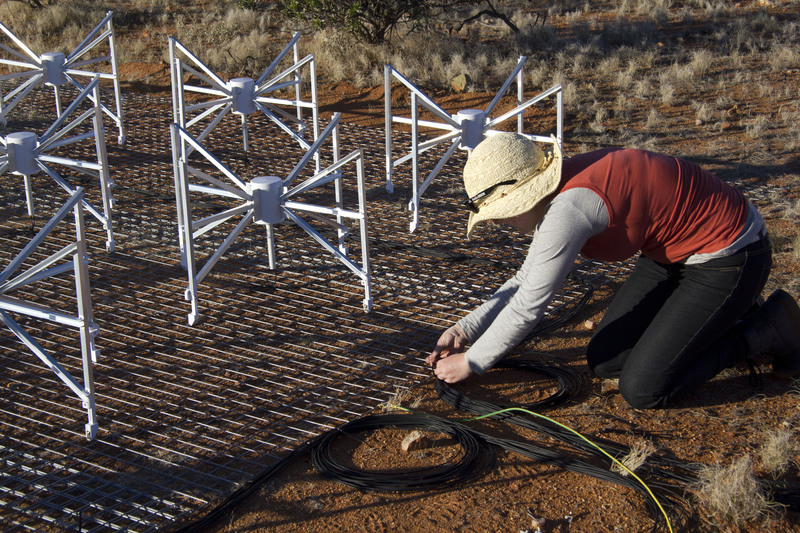 No, really this is great as it means we can get the alpha and beta parts of the array ready for science commissioning – all they’ll need is to be hooked up to the receivers. The first of the beam formers we hooked up today. It took us about 30 minutes for each one, so we’re looking good for a finish! I described the beam formers and what they do back in ‘How to make a dipole’. 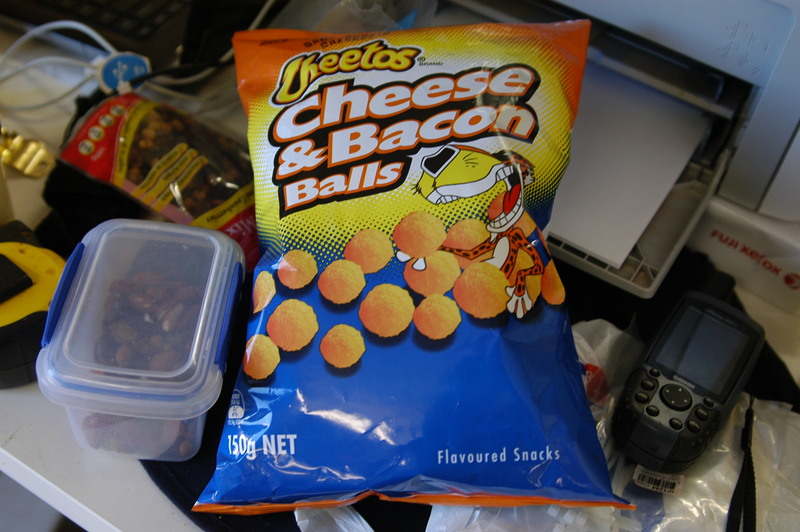 The beamformers came along with a care package of tools, cheese and bacon balls (yes more) and coke from home base – thanks for that guys! 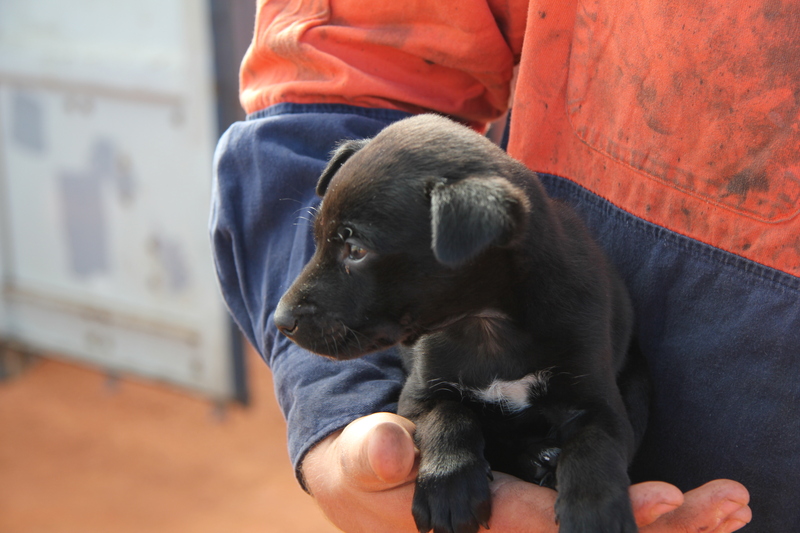 We also had a little visitor come along in the ute. This little cutie came along for the ride with our beamformers. We wanted to keep him, but unfortunately weren’t successful. He could only pop out of the car for a few minutes because he was so young. Food, as always, has been a highlight. Wooleen sure take care of us. 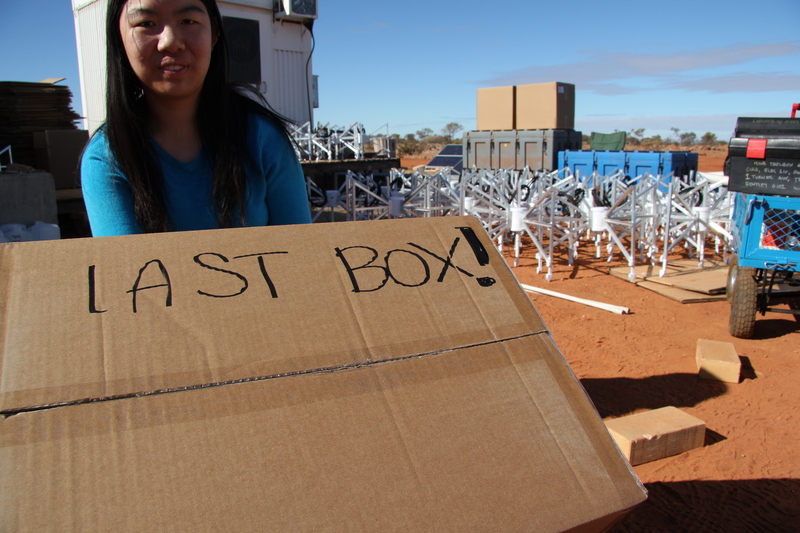 Sue with the last box of dipoles! Wow were we glad to see this come by. 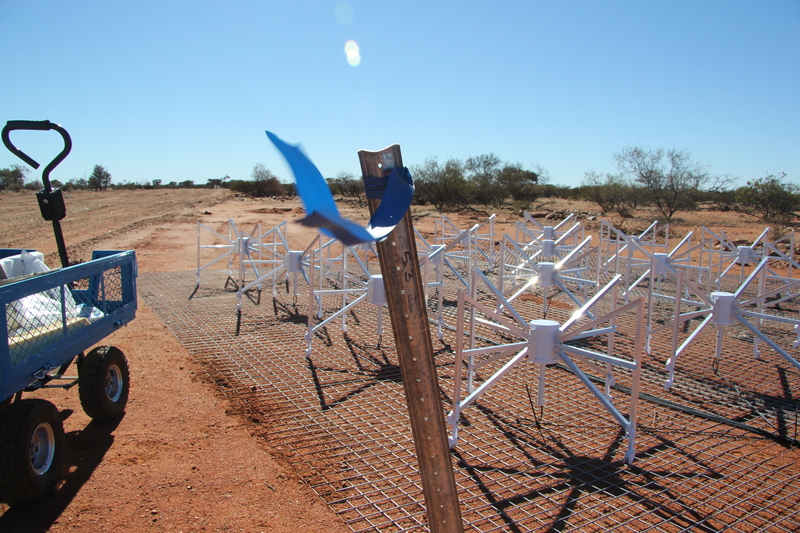 Wow, are we glad to be finished constructing dipoles. 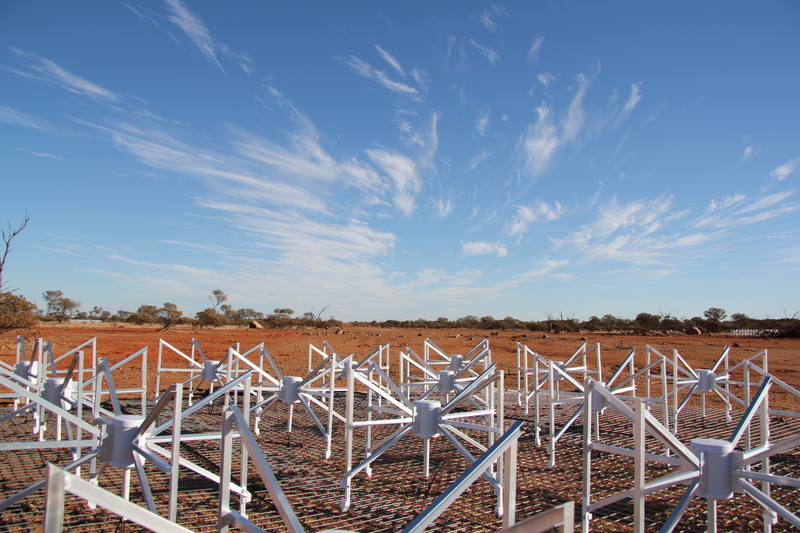 It feels like a massive achievement, and a big stepping stone on the way to the whole telescope being done. There were lots of smiles today! 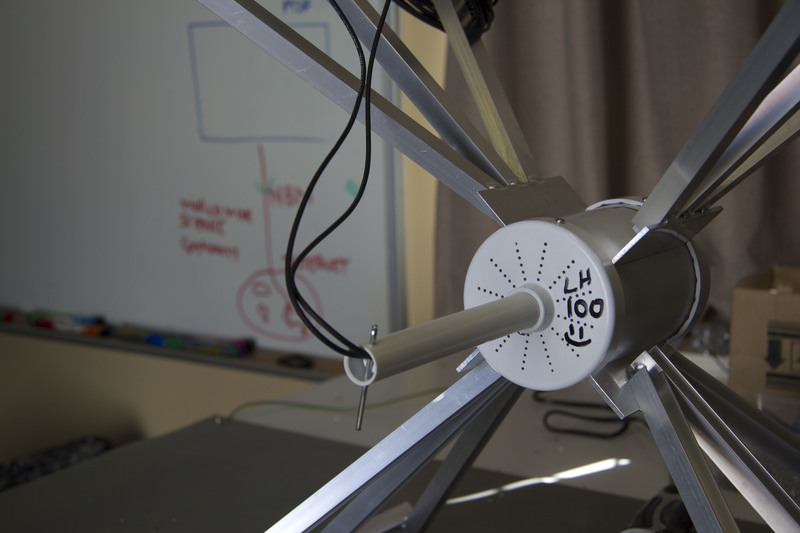 Our very last dipole – numbers 4095 and 4096 (each turret is two dipole antennas). The team clipping down dipoles for our final tile. A satisfying feeling, that’s for sure. 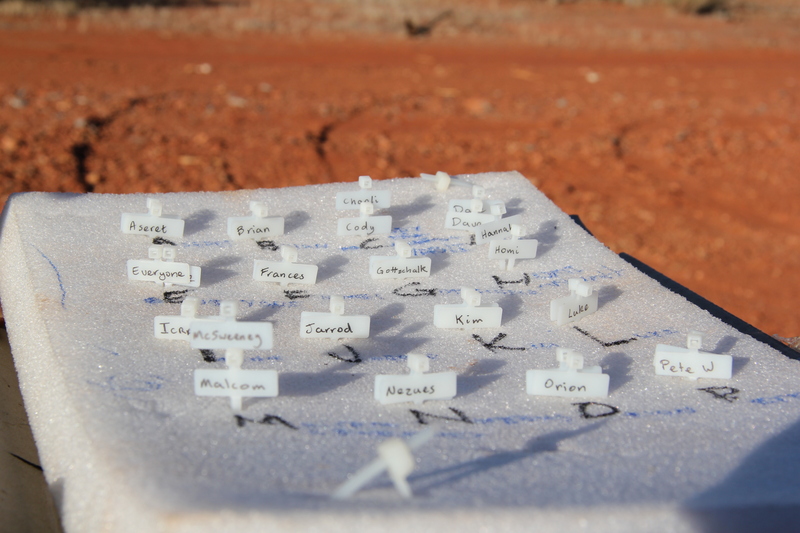 The labels for the final tile were a little different; some of the team made a label significant to each person on the team and a few other students and staff who have been working on the MWA. Certainly gave me the warm fuzzies to see these labels. The last tile! 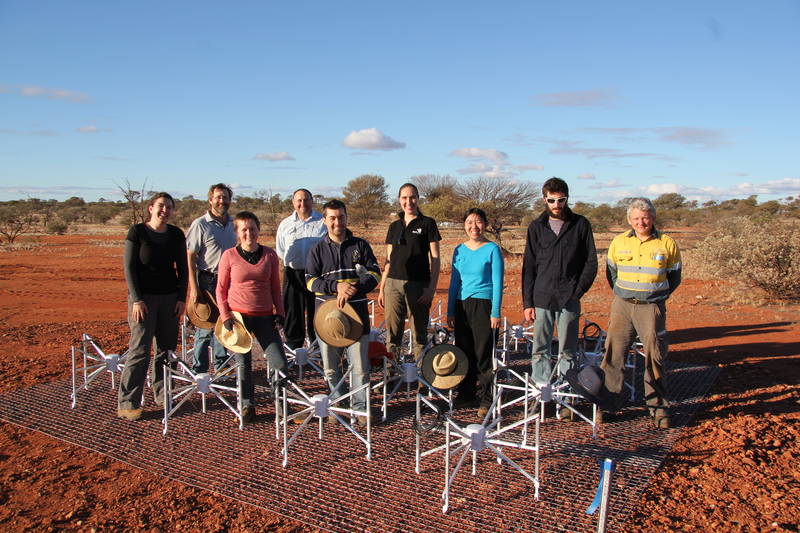 The team with dipoles clipped on to the very last tile of the MWA. We can see the finish line now. Now we head home through the gorgeous Murchison. 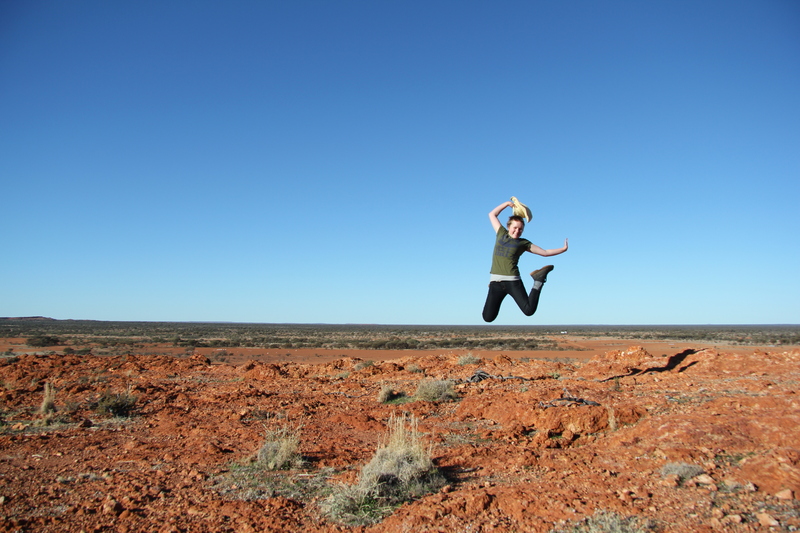 It’s a real treat being out here in this part of Australia. 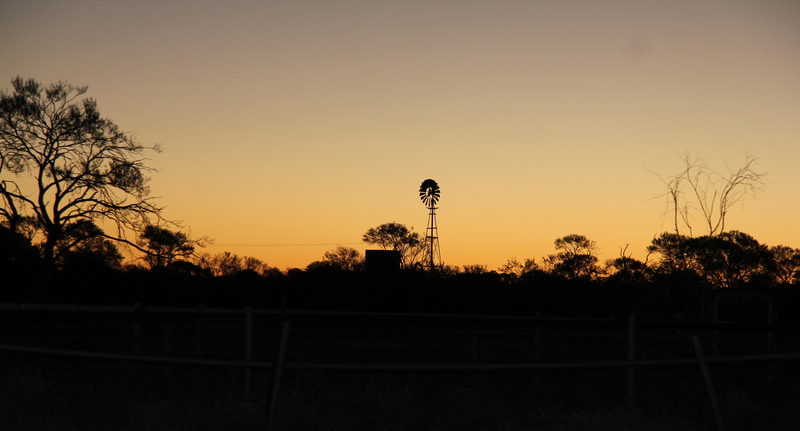 Every evening we drive past this gorgeous view at the Wooleen Woolshed. Photos just can’t do this part of the country justice. 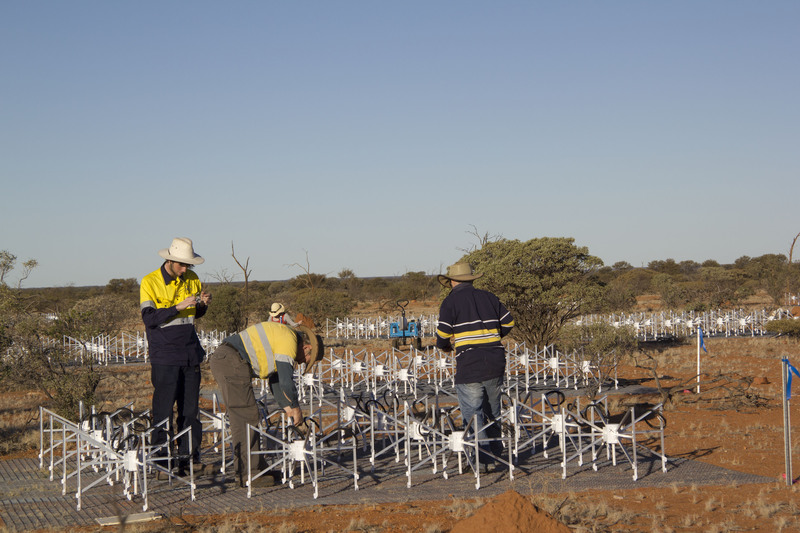 We had a very good day again – we’re so close to finishing all the dipoles. Only 100 turrets left and we’re there, so, so exciting. 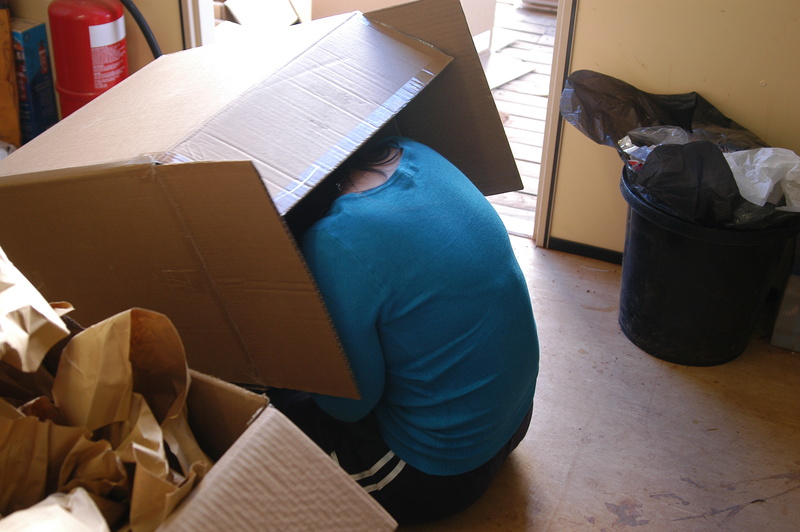 The pile of boxes has steadily decreased – this is the last lot, our shipping container is completely empty. 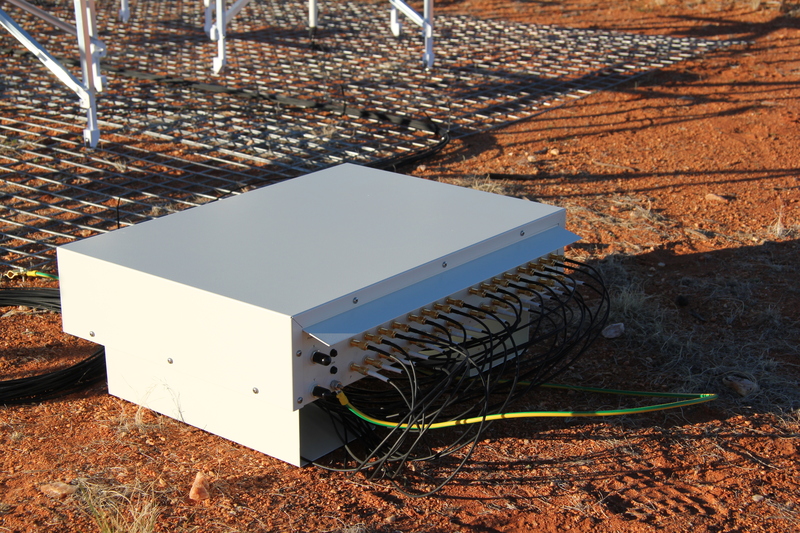 The very last of the dipole boxes, as of this morning. We didn’t get through ALL of these – but we’re close. 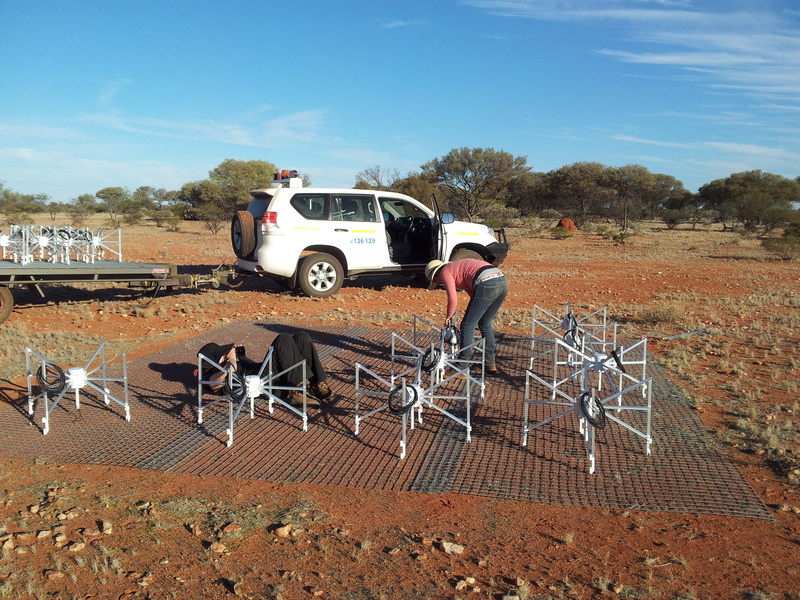 We also had a team out ranging far from base to get to the final tiles. We have dipoles laid out and labelled on 114 tiles, so now just cabling required. We’re also expecting the beamformers tomorrow morning, which brings in another job as well. 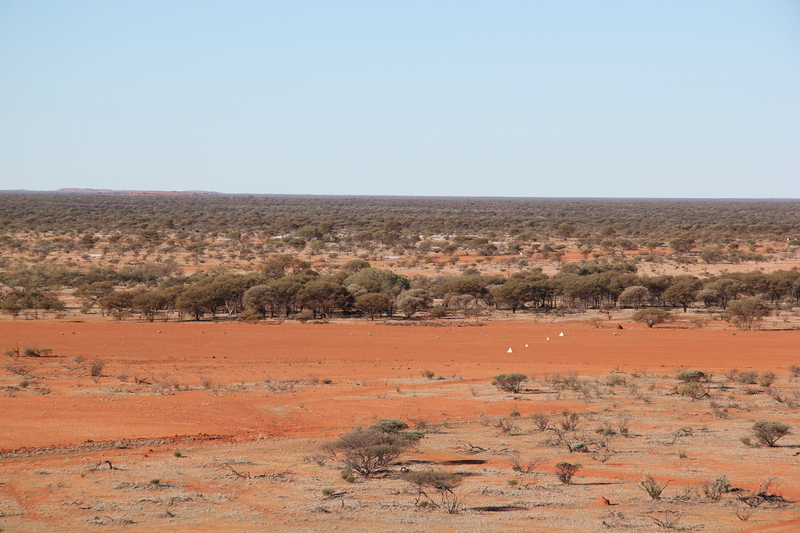 We’re down to the furthest tiles from the core now, so we have to do quite a lot of bush ranging to get to each. 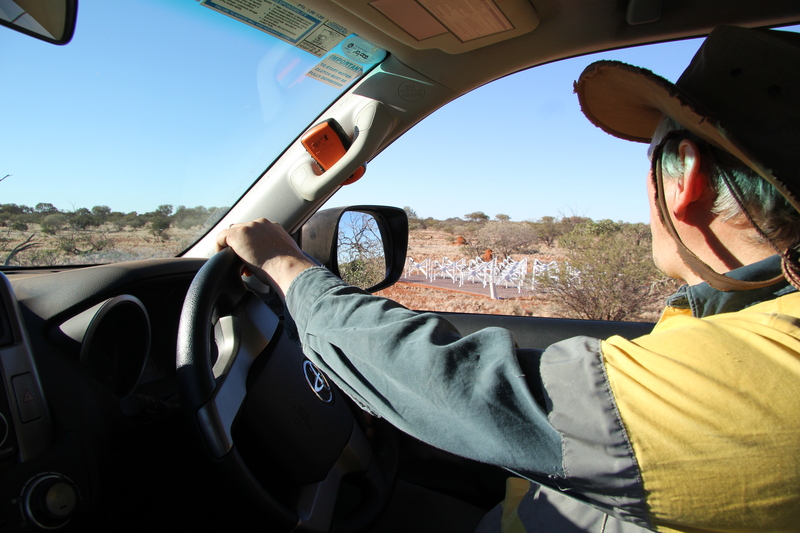 Engineer Dave is expertly dodging bushes and trees in the 4WD to get to this far-flung tile. 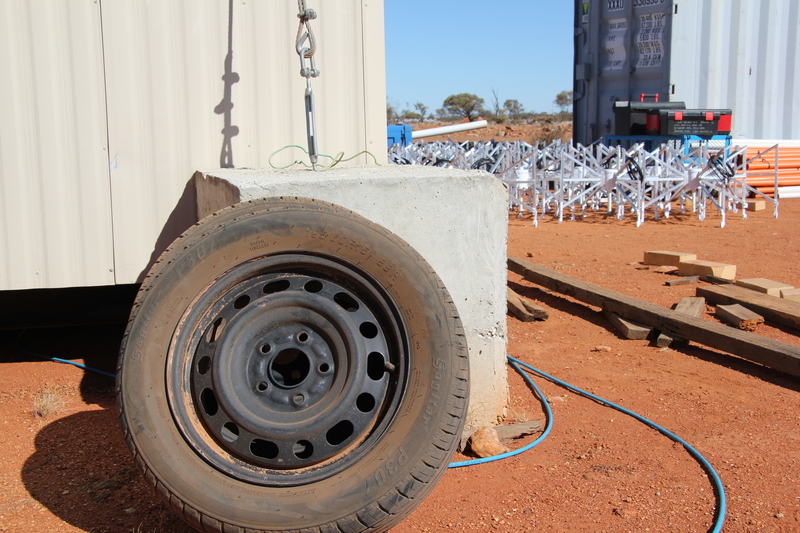 Spare tires, ready for emergency use. We’re looking forward to finishing the last dipoles tomorrow morning (wow!) 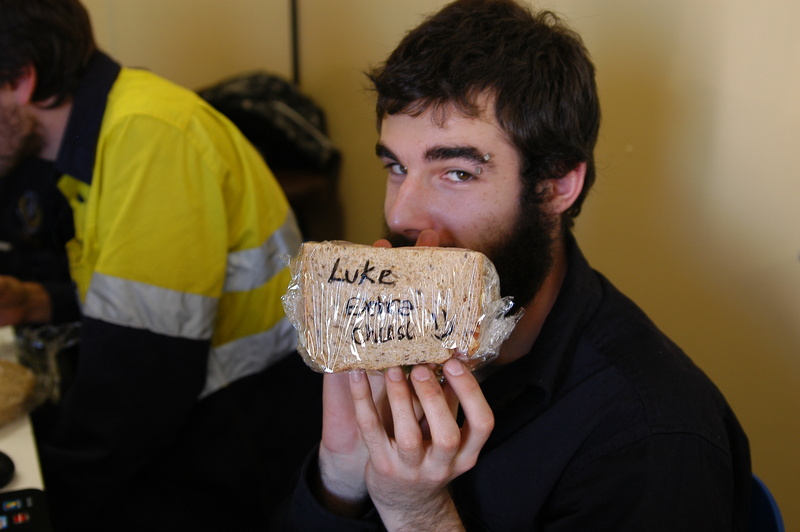 and the truck from Perth bringing up our beamformers, along with a care package from home base. Only 3 days left and we’re looking good. 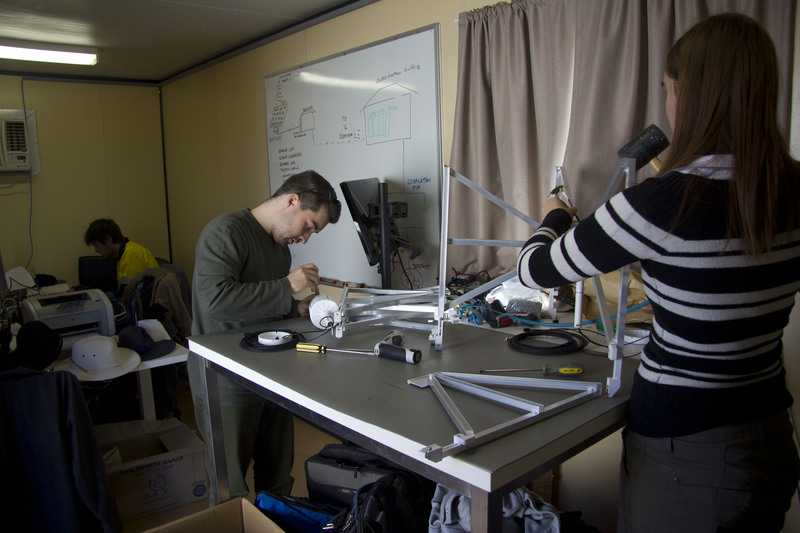 Today was dipole factory day, and i’d say we succeeded. As evidence, I present today’s dipoles in all their stop motion video glory! We didn’t actually cable any tiles today, and probably wont tomorrow. We plan to finish all of the dipoles by Sunday morning (crossing our fingers we can make it) and then do a final cabling push on Sunday through Tuesday. We’re expecting the elusive beam formers to arrive on Sunday, so we’ll be hooking those up too. 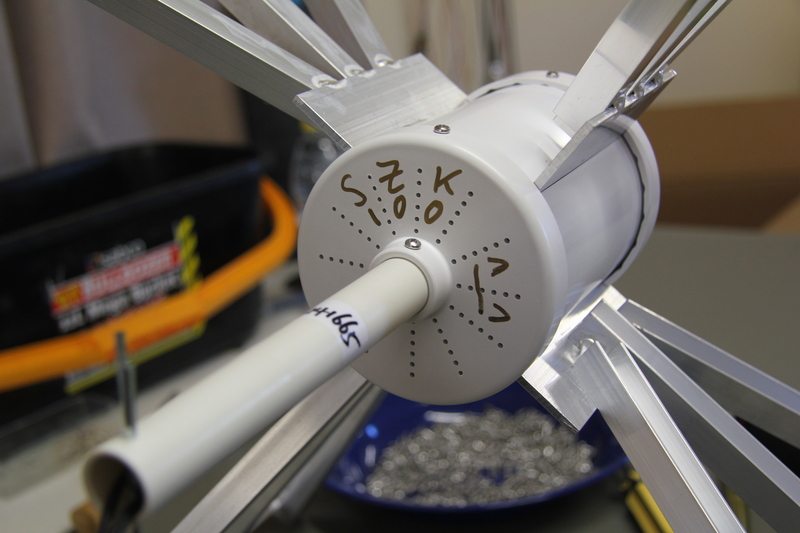 Just some of the dipole turrets we created today. 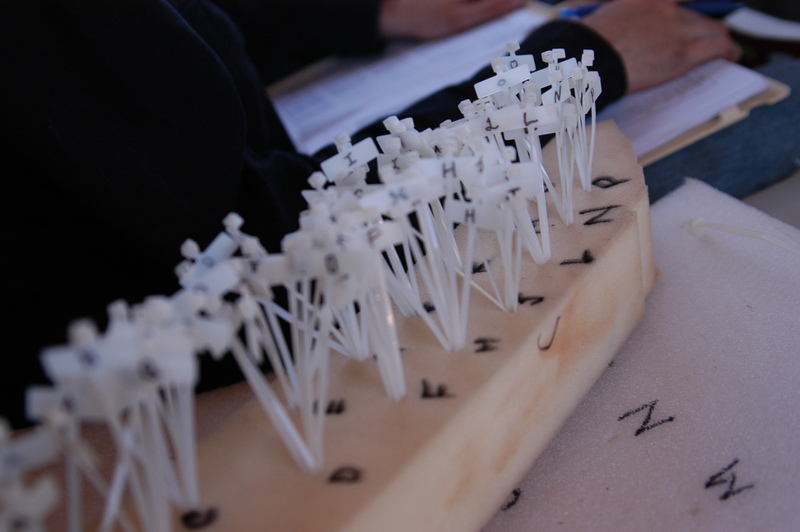 It really was a creative day – don’t look any further until you’ve watched our stop motion! A final shot, actually from yesterday. The lengths I go to to get you all some pretty photos to look at! We’re over halfway! Today we fully completed our 64th tile, making us more than halfway through constructing the MWA tiles. We’re also on day 7 of 12 out here in the Murchison. It’s all downhill from here. We continued as per the rest of the trip, building and laying out turrets and cabling up the tiles. 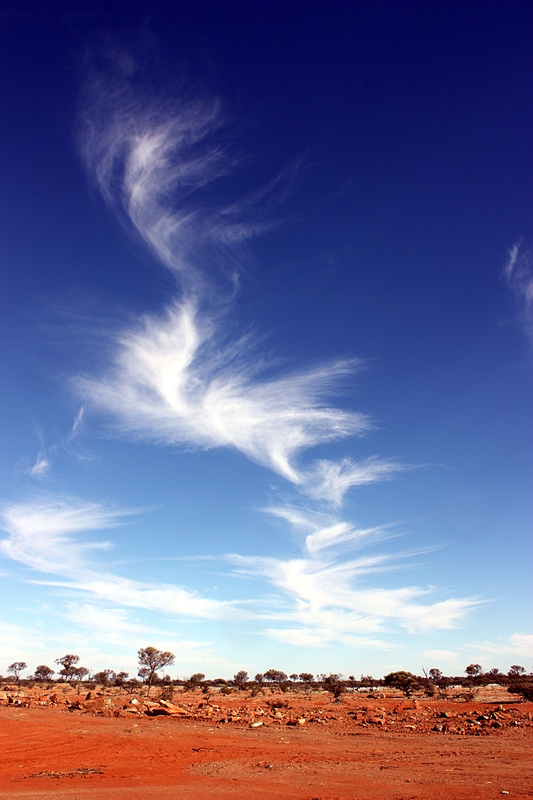 We’ve had incredible weather the past few days with gorgeous blue skies, but today there were a few interesting wispy clouds around. This meant we took the opportunity to enjoy the view whilst getting about our work. The sky has been incredibly blue every day out here – but today there were clouds! Time for some sky over dipole photos then. We are venturing further and further afield to tiles that are not yet done, filling in the gaps on the map. 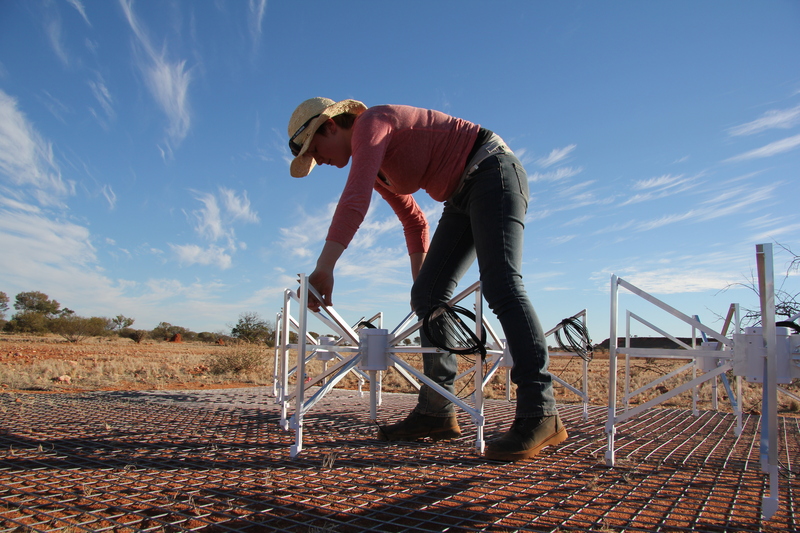 Kim clipping some turrets onto a tile over near the airstrip. Clippity Clip. You can catch a glimpse of a ‘breakaway’ in the background. 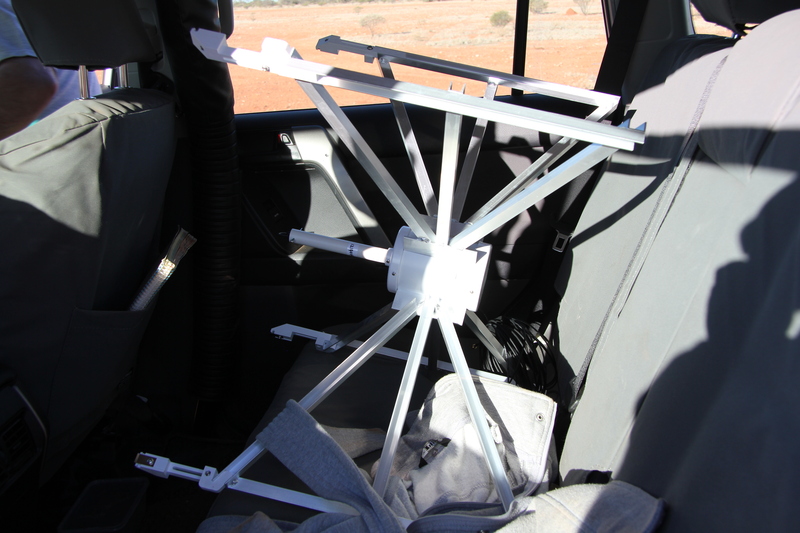 Every now and again a dipole turret makes a break for it, and jumps off the trailer on the way to a tile. So now we make sure to carry one around on the back seat of the Prado ‘just in case’. Nothing more frustrating than driving cross country for 20 minutes to a tile, only to find you’re a dipole short! Tomorrow is a day of dipole making. Our goal is to get a good way towards the 75% mark on the dipoles so we can start concentrating on cabling on the weekend. As always wish us luck. We’ll leave you with a frenzied view of our dipole making factory, sped up by 1500%. 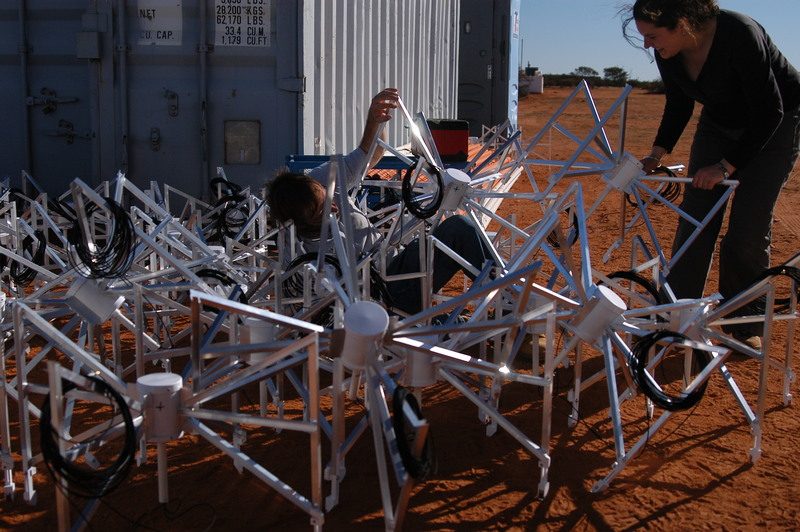 Another productive day out in the Murchison today, but first we’ve been listening to the exciting CERN announcement live whilst building dipole turrets. Go CERN and the Large Hadron Collider (LHC) – we’re all very excited for you and your excellent result.If you’re not too sure what the Higgs Boson is all about, this video might help. The LHC is often called the largest science experiment on Earth, but I’m proud to say the SKA will overtake it when it’s all finished. 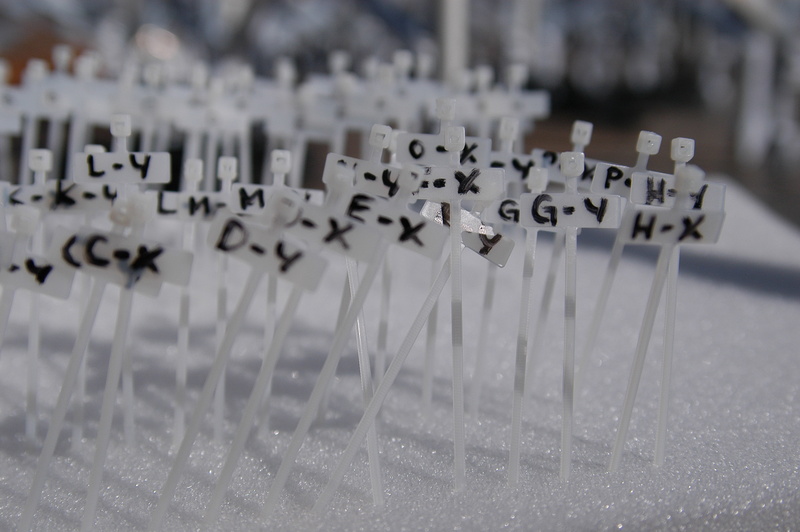 It’s certainly an exciting time to be a scientist! 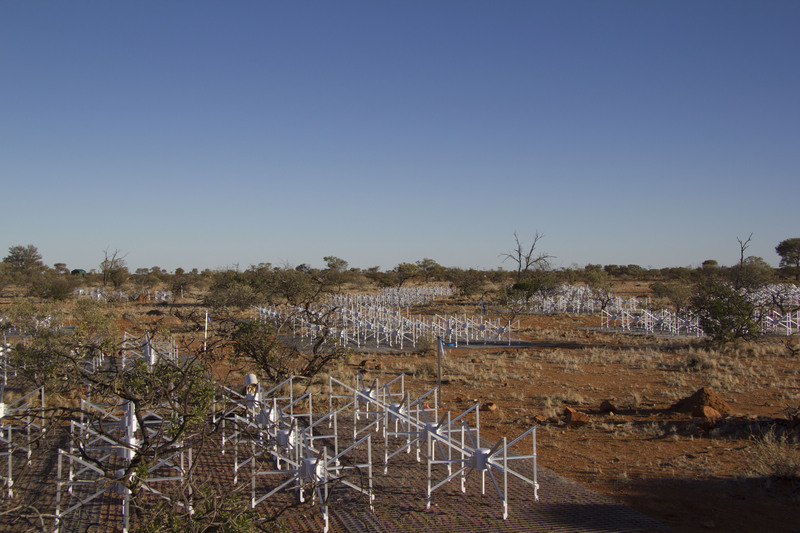 Today (day 6) we crossed the ‘alpha’ and ‘beta’ parts of the MWA off our list – bring on the ‘gamma’ section next. 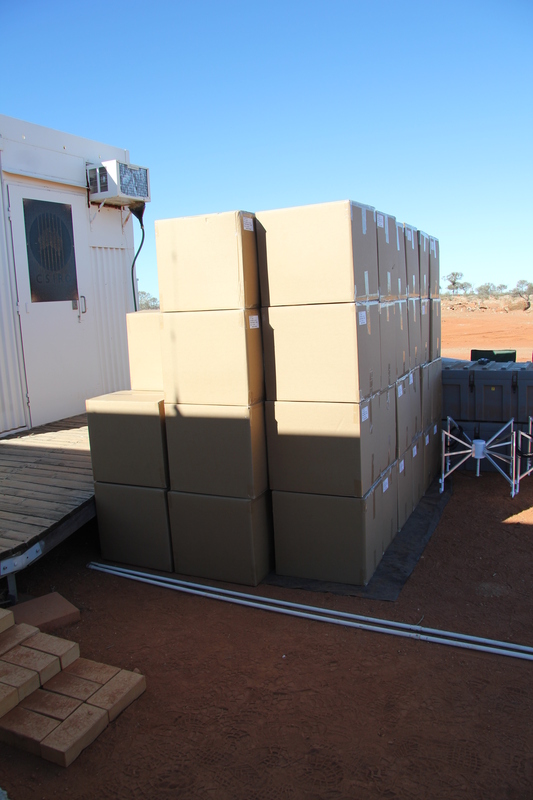 This is good, good news as once beam formers arrive on site and are installed, and then hooked up to the receivers, these sections are first for ‘science commissioning’ – so they’ve been our number one priority for the student army trip. Everything else is just icing on the cake! We’ve crossed the divide and started constructing tiles to the South of the office! Now we’re working far more spread out which makes the tiles seem lonely to me. 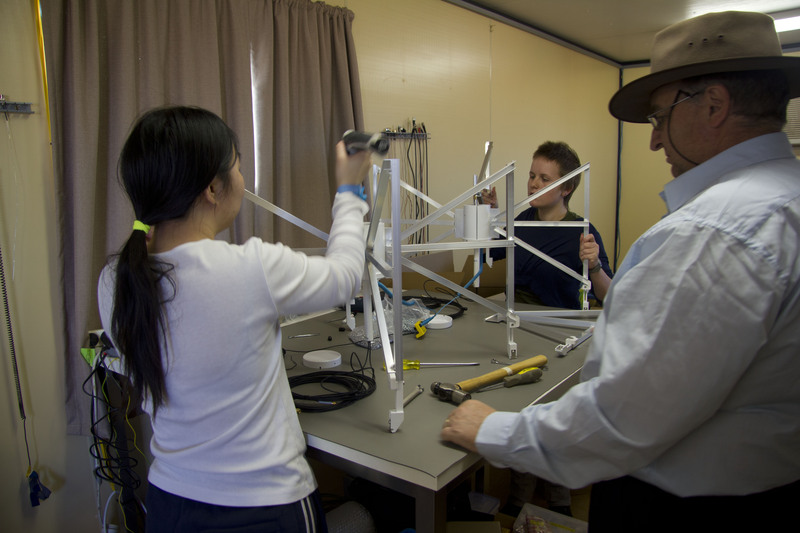 The students are getting very good at dipole creation, it’s like they’re breeding. I have a timelapse of them piling up waiting to be clipped on tiles that should be ready for tomorrow. Many of them are ‘unlocking achievements’ left right and centre. I’m loving seeing what decoration they all add on their significant numbers. 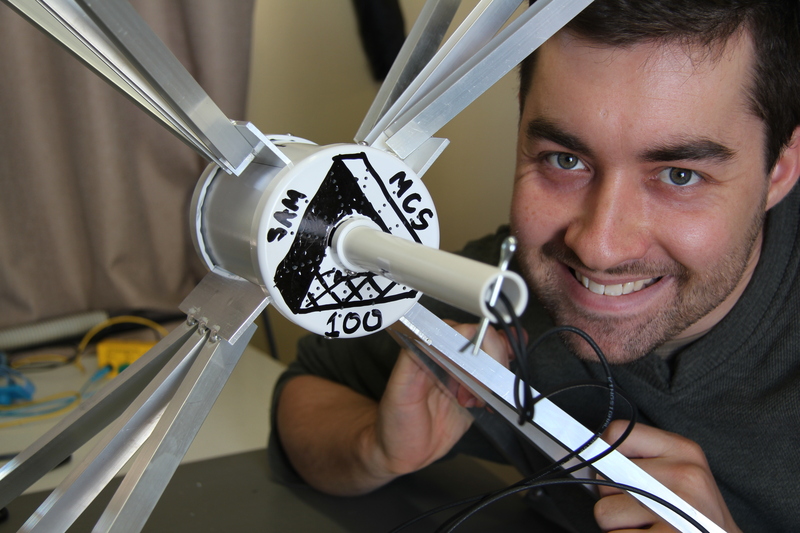 Student Army Officer Sammy McSweeny with his 100th dipole turret. Student Army Officer Sue Khoo’s 100th Turret. 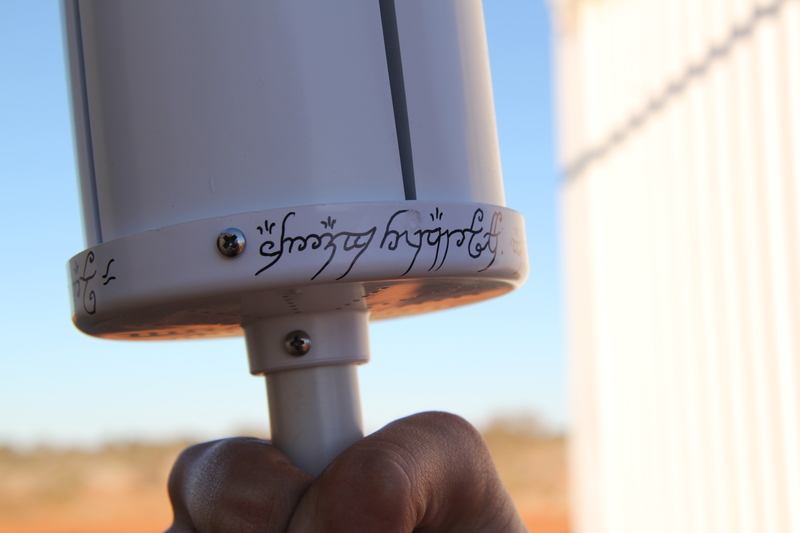 Just quietly, Sue is a big Portal fan and is reponsible for our renaming of the crossed dipole antennas to turrets. 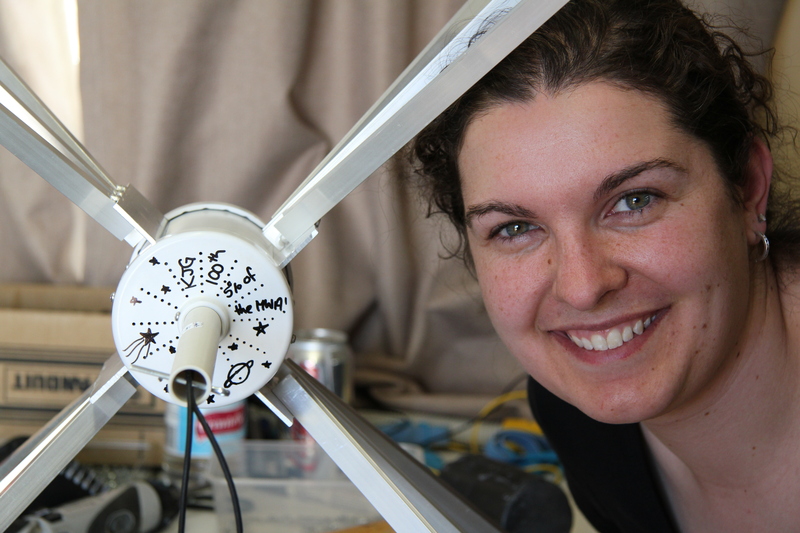 You need to create your own entertainment within the tedium of making dipole turrets! This annotation thanks to student Teresa Slaven-Blair. There are a few more of these ‘easter eggs’ for the engineers and scientists to find during commissioning and repairs! I unlocked my own achievement today, cabling an entire tile on my own. I fully cabled my own tile (only took about 1.5 hours!) This means I get to name it, right? I vote yes! 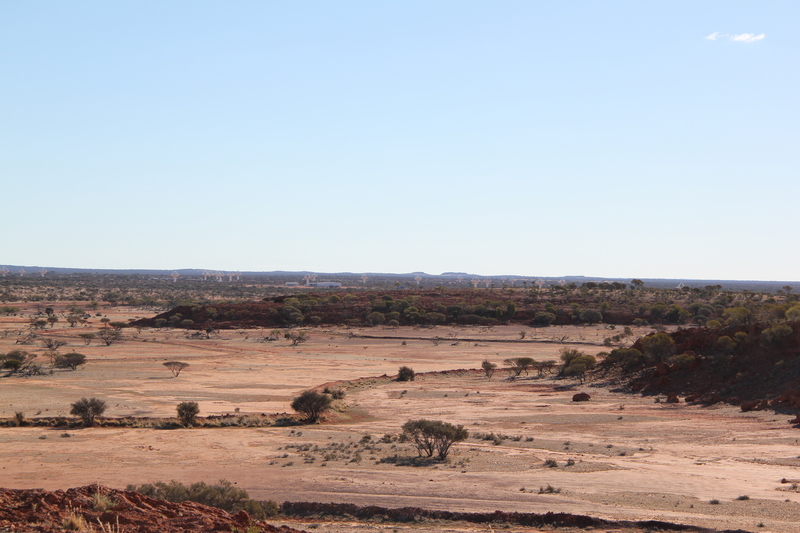 So, all up another great day – and we’re now halfway through our time in the Murchison. I took this timelapse of us in the core region on Day 4 – it accounts for about 3 and a half hours of real time and shows how fast everything has been springing up. I wish I could take a photo of the whole MWA for you all, but I’ll do second best and get a map that shows the layout uploaded for tomorrow. We’re halfway there in time, and halfway there in tiles (61 tiles fully complete, with three more laid out and just needing cabling). It looks like we’re in a good position to finish it, but as we get further from the core it takes longer to lay out the tiles, so it might look more promising than it is. Cross your fingers for us folks. 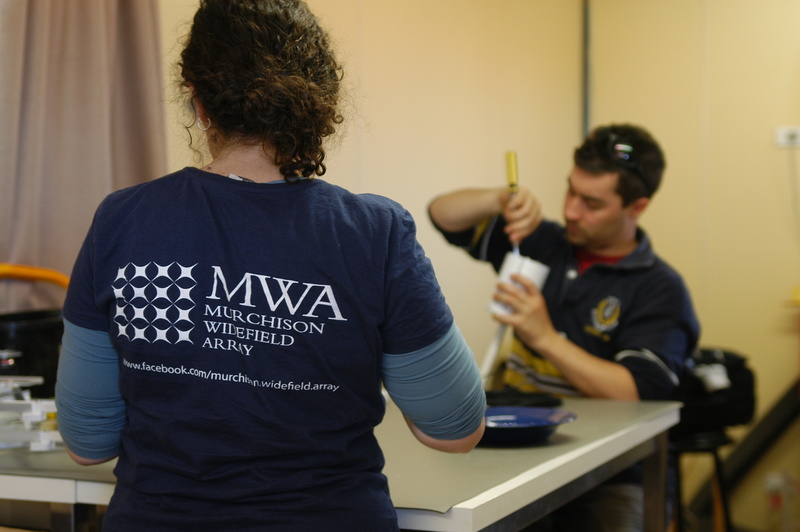 We’ve almost finished the core section of the MWA, so we’ve had another good day for day number 5 out here. Morale remains high, and the student army are doing extremely well. The core is almost full! On a personal note, I got myself into the dipole building game (out of the label-writing and dipole clipping job) and finished my first 35 ‘turrets’ today. I’m suitably proud, even though all other members of the army are well over 50 each! Luke Horsley’s 100th crossed dipole ‘turret’. Here’s a small tour of the site that I shot yesterday. You’ll have to forgive the bumpy camera, it’s hard to hold it super steady when walking over rough ground and I was rushing so I could get back to work. I think we’ve got into a good rhythm with laying out cables, coiling them up and clipping on dipoles. 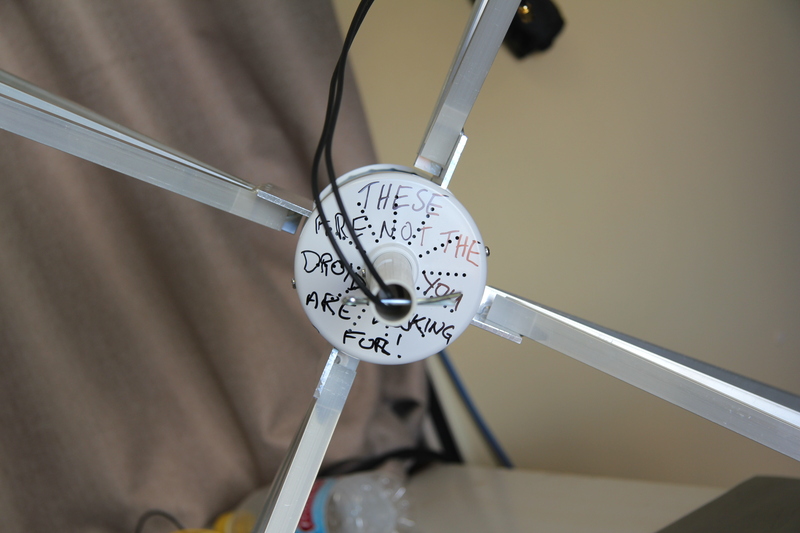 We’ve definitely got a rhythm making dipoles in the office. It’s all looking good! 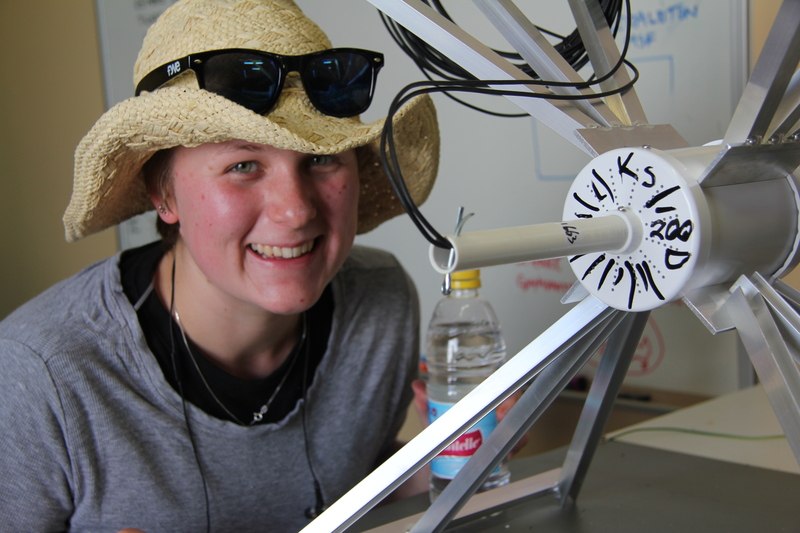 Kim coiling the cable ready to attach to the beamformers. Jarrod, Engineer Dave and Sammy laying out the cable from each dipole on a tile. 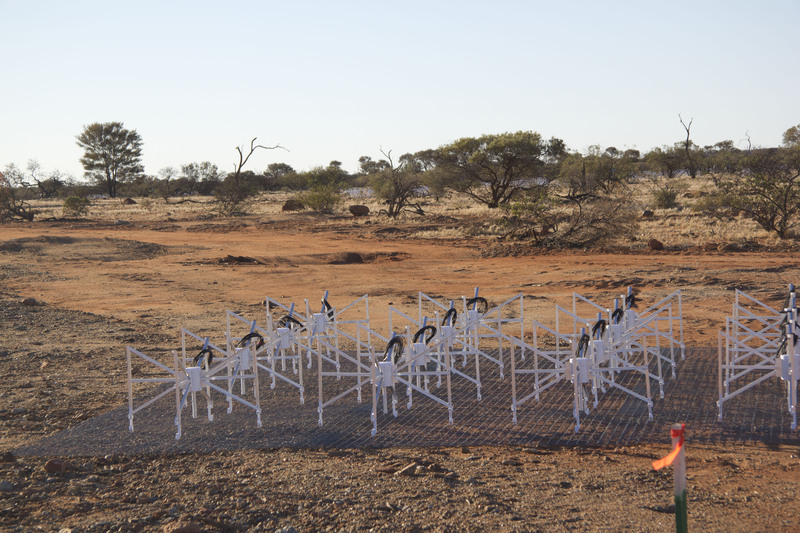 Today continued much the same as yesterday, we built as many dipoles as humanly possible, laid down a bunch of tiles and had another good, productive day. 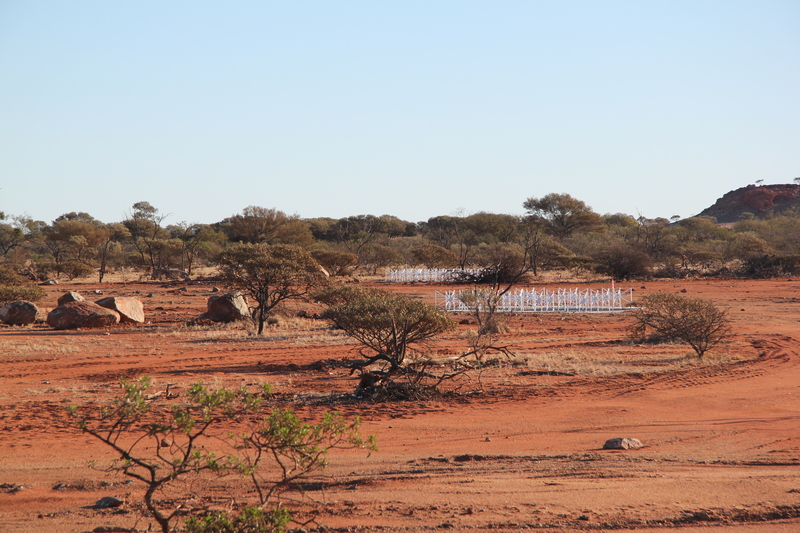 We finished laying out the ‘alpha’ array, but didn’t quite get it all cabled – which works out perfectly to keep non-dipole builders busy tomorrow morning. The view in the core of the MWA earlier today. To give you a true appreciation of just how fast 1 minute 43 seconds is, Kim Steele starred in this great video yesterday afternoon showing off what goes in to building a dipole. 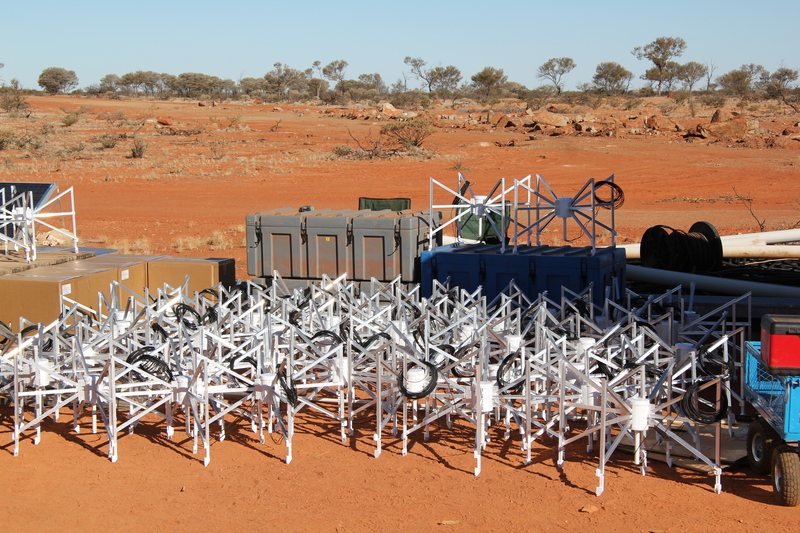 I quizzed engineer Brian Crosse about ‘science commissioning’ and it turns out there’s a thing called engineering commissioning that happens first, which is when all the tiles and beam formers are attached to the receivers and the electronics and engineering functionality is tested. 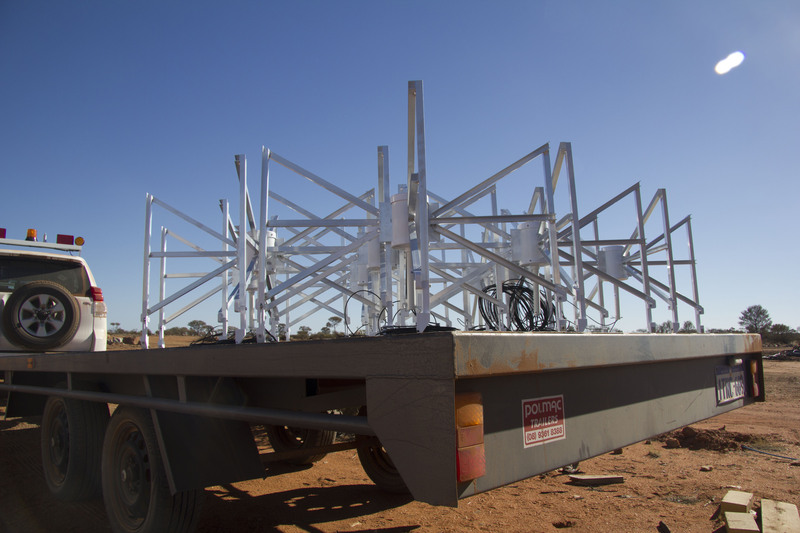 So a beam former ‘forms the beam’ on the sky or determines where the telescope is looking – which all happens electronically in the MWA, one of the reasons it’s so unique. The receiver (one for eight tiles) turns the analog electrical signal into a digital signal that computers can understand. 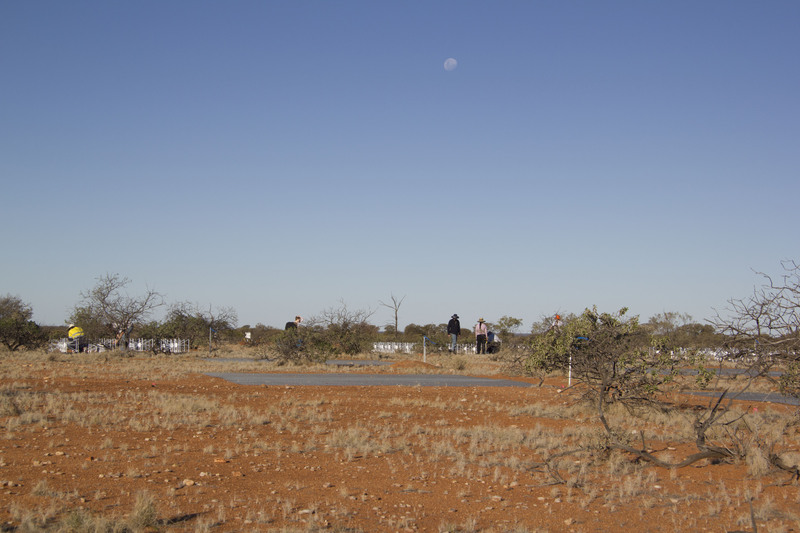 After the engineering commissioning, the engineers hand over to the astronomers for science commissioning which involves taking some astronomical data with the telescope and making sure everything works the way we expect it to. 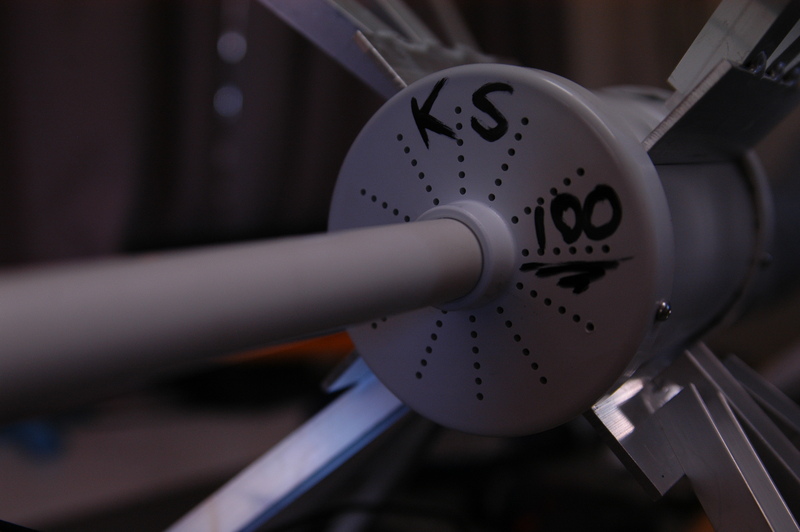 The dipole making competition is starting to hot up even more, with both Kim and Jarrod reaching 100 dipoles each today. 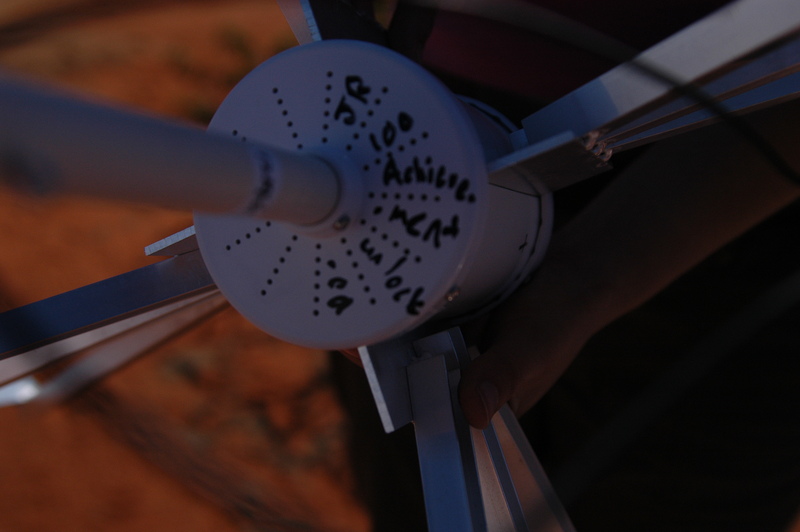 Some of the students are making sure to sign and number each dipole they make – brings to mind limited edition artwork! The students have renamed the antenna groupings ‘turrets’ to avoid confusing what is an antenna and what is two antennas (each spidery looking thing is two crossed dipole antennas). We’ll see if it sticks! We’re getting there! This was the core this morning. Comment with any requests folks – I’ve done a very dodgey tour of the site on camera which i’ll upload tomorrow, and we’re working on another timelapse of the core region. Anything else you’d like to see? 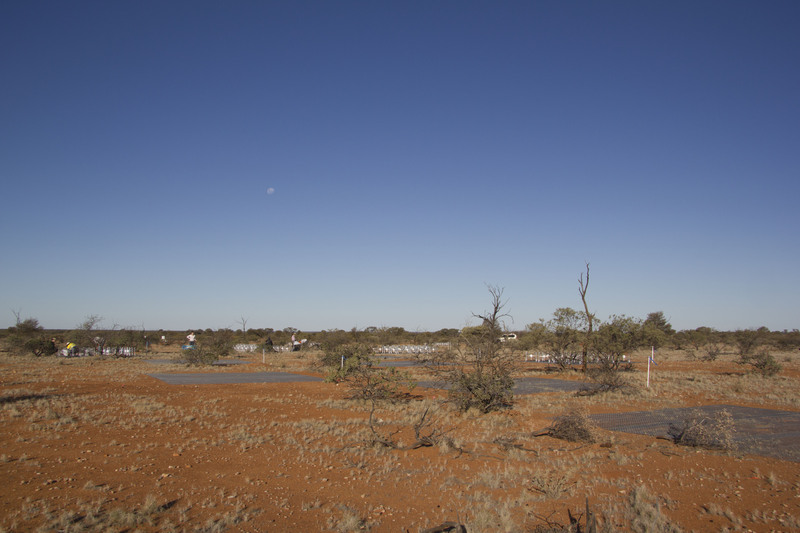 I’ll leave you at the end of day 4 with a lovely timelapse of last night’s sky at wooleen – put together by student Malcolm Whinfield. About two thirds of the way through the almost-full Moon sets and you get a good impression of how many stars are visible up here – the sky is simply stunning. See you tomorrow! 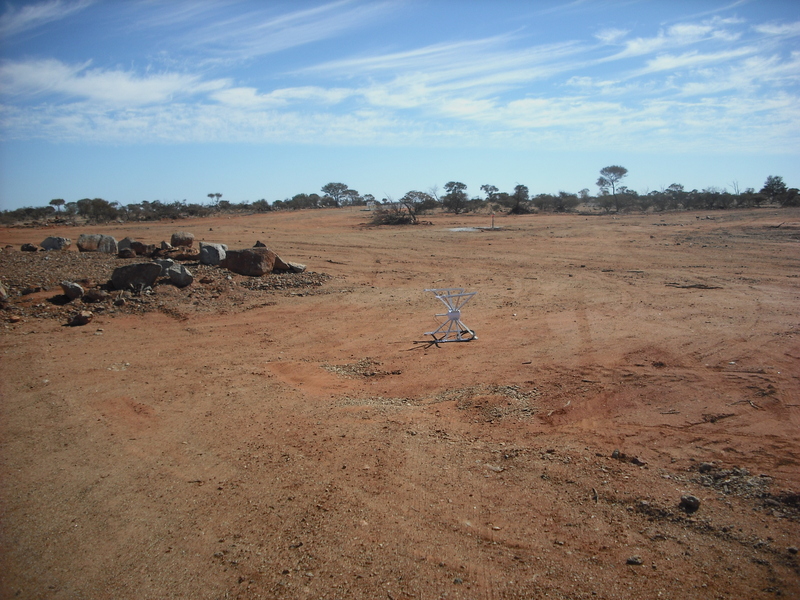 Today was a great success – so much so I’ve got barely any photos to share – we were all far too busy building dipoles and laying out cable on the tiles! There have been lots of groans brought on by engineer Dave’s terrible puns (such as ‘2 B’s or not to B’s’ when I request two B labels) and some healthy competition between students to see who can build the most dipoles (Jarrod is on 51 something and Luke is winning by a bare margin at 55.) 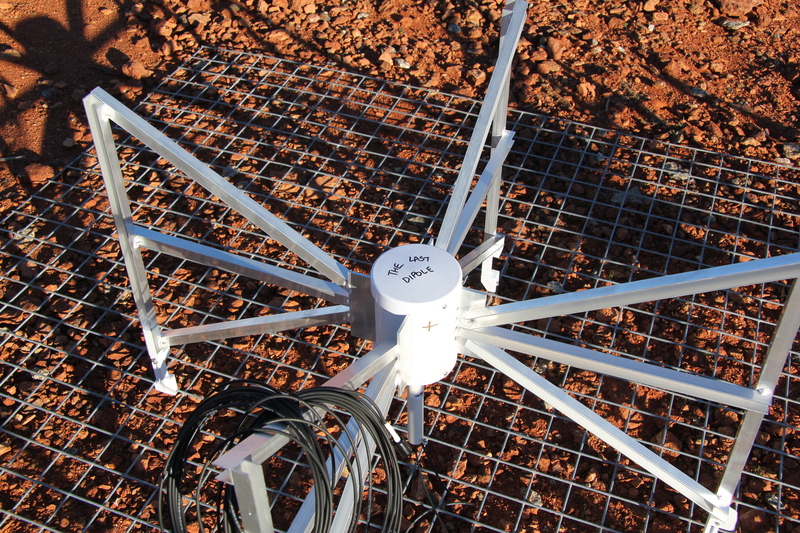 Jarrod’s target for tomorrow is 50 dipoles, we think he can reach it – he’s become very very fast! The core area is starting to fill up! 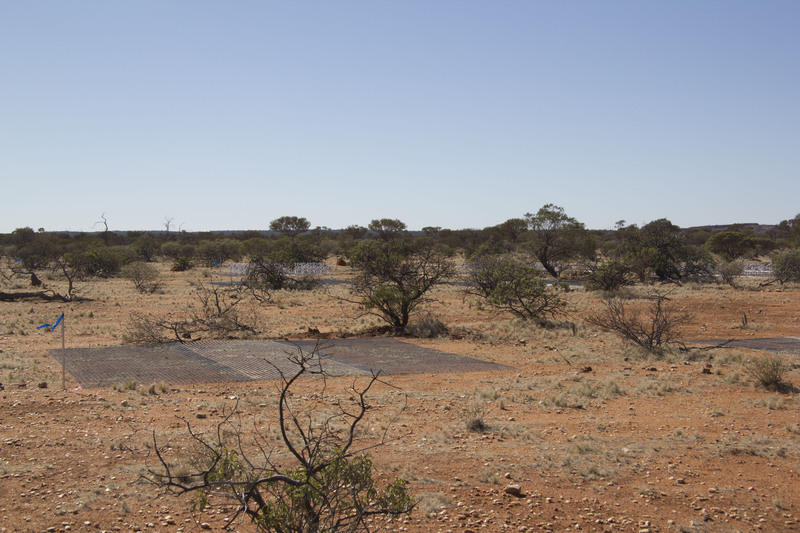 We’ve finished 19 tiles, 13 today, which means we’ve made a big dent in the ‘alpha’ section of the whole MWA – the bit that the astronomers will come along and do ‘science commissioning’ on first. I’m going to try pin down exactly what science commissioning is tomorrow! I’ll report back here. 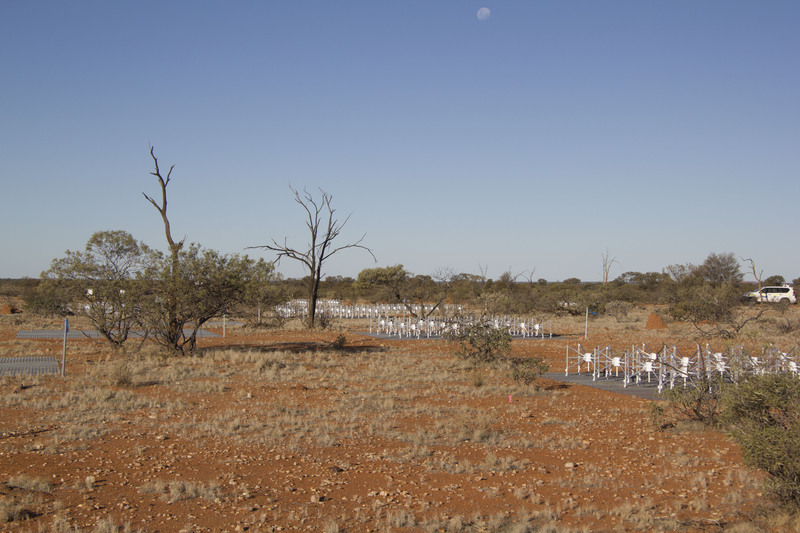 On the way in this morning we drove past ASKAP, which just recently celebrated the construction of all 36 dishes! 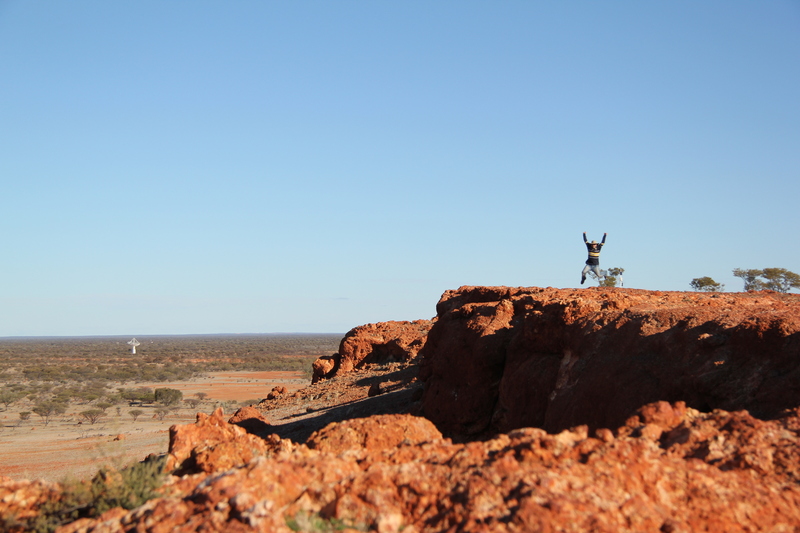 It’s great to be up here and see the progress CSIRO is making on finishing ASKAP, and how great the MRO is looking with telescopes all over the place (springing up at an alarming rate over here on the MWA site). The video I promised today of dipole construction will have to be tomorrow, too busy cabling and building dipoles today! The Moon watches over us laying the final cables on today’s tiles. Video to come tomorrow of one of our students showing off how to build a dipole. We built our first full tile of the MWA! Dipoles ready for their trip out to the first tile. It took us about 45 minutes to make the first tile (not including dipole building time) – here’s what it looks like sped up 1500%! 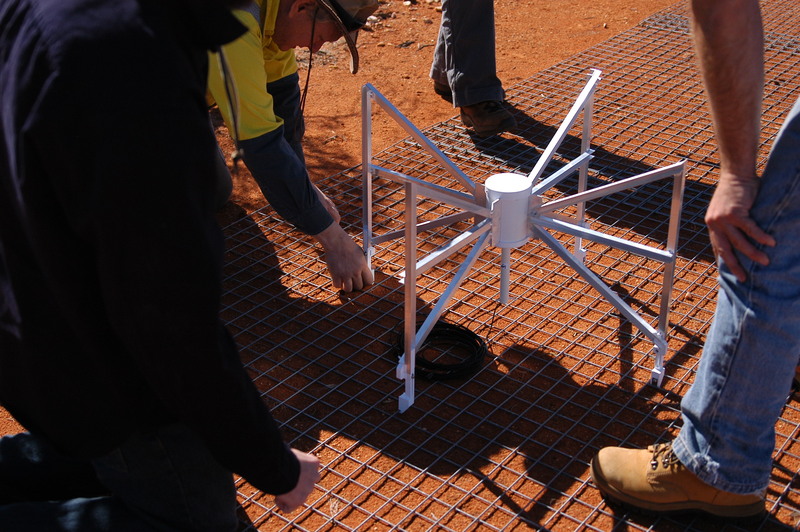 We then split into teams and started building large piles of dipoles and then putting together the tiles. We think we’ve worked out a good method of getting things done quickly, and we’re already speeding up and heading towards peak efficiency. I’m cautiously optimistic that we’ll make it.